Yes, I realize St. Patrick’s Day was nearly a month ago. Yes, I also know Easter has come and gone. 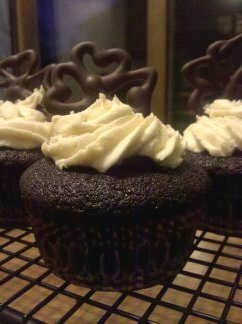 But these are one of the cupcakes I’ve had my eye on for some time and finally made. I don’t think it’s fair to keep them until next St. Patrick’s Day! You never know when you’ll need to sweet-talk a group of leprechauns (okay, bribe with bakery!) These might be the one thing standing between you and that pot o’ gold at the end of the rainbow! I’ve made the cake and frosting before, but never gone all-in and made the ganache. Honestly, I was busy and knew the extra steps of making the ganache and filling the cupcakes would be too much at the time. But I couldn’t get this recipe out of my head – the combination of a dark chocolate cake made with Guinness, dark chocolate and whiskey mixed together to fill the cupcake, and Bailey’s, butter, and sugar to top it all off? Tell me that doesn’t have you curious! The verdict is… I’m glad I made these but I can’t say I’d make them again unless someone specifically asked for them. (Maybe for a theme party or Guinness fan.) The flavors came together more by the next day, but they’re not my favorite cupcake ever. It was my first venture into ganache so I’m glad to have given it a shot, though! Remember… I’d said this was my first time working with ganache, right? Per the instructions, the ganache should cool slightly, so I thought “I’ll do _____ (I can’t remember what it was I did now) while it cools…” Mistake. I found out ganache hardens as it cools. LOL So don’t plan for too long of a window for the ganache to cool. I also didn’t have enough to fill all of my cupcakes. Deb states that “the Bailey’s is fresh and potent”… that’s the best way to describe it. I can’t say I followed the amount of Bailey’s exactly as I had the mini-bottles and used probably 2/3 of one. This frosting isn’t for the weak of tastebuds, but added a nice contrast to the cake and ganache. The sweetness, I feel, is necessary with such dark, strong flavors. Before beginning, allow all ingredients to warm to about room temperature. Preheat oven to 350°F. Line 24 cupcake cups with liners. (I ended up with a little less ~22 cupcakes, maybe?) Bring the stout and butter to simmer in heavy large saucepan over medium heat. Add cocoa powder and whisk until mixture is smooth. Cool slightly. In a large bowl, whisk flour, sugar, baking soda, and salt to mix. In the bowl of a stand mixer, blend eggs and sour cream. Add stout-chocolate mixture to egg mixture and beat until just combined. Add flour mixture and beat briefly on slow speed. Using rubber spatula, fold batter until completely combined. Divide batter among cupcake liners, filling them 2/3 to 3/4 of the way. Bake cake until tester inserted into center comes out clean, rotating pan once halfway through, about 17 minutes. Cool cupcakes on a rack completely. Chop the chocolate and transfer to a heat-safe bowl. In a saucepan, heat the cream until simmering. Remove from heat and pour over the chocolate. Let sit for one minute, then stir until smooth. (If the chocolate is not sufficiently melted after a few minutes, return the mixture to a double-boiler to gently melt what remains or microwave on 20 seconds, watching carefully.) Add butter and whiskey (if you’re using it) and stir until combined. I had more cupcakes than I did ganache, so I wound up using the centers I had cut out. I trimmed off most of the center, leaving the top about 1/4″ thick and covered the ganache-filled hole before moving on to frost the cupcakes. Whip the butter until light and fluffy using a handheld or stand mixer. Slowly add the powdered sugar, a few tablespoons at a time. When the frosting looks thick enough to spread, drizzle in the Bailey’s (or milk, if cutting out the alcohol) and whip until combined. Add another spoonful of powdered sugar if necessary.